For a year or two there October became synonymous with Dreadtober. 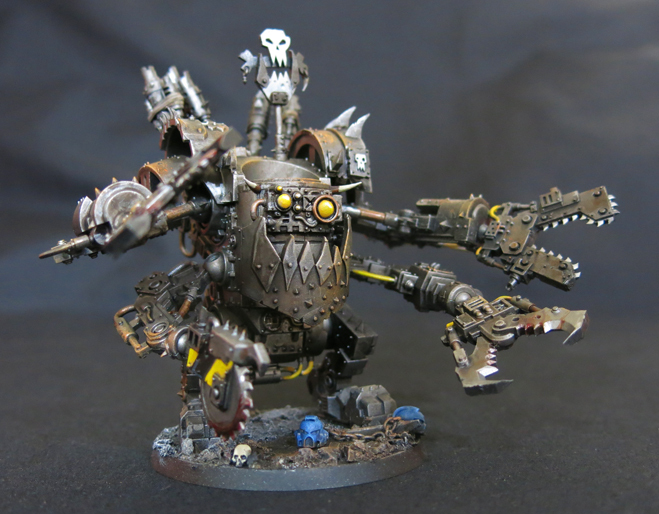 Conjured up by Greggles at FeedYourNerd in 2015 it was a fairly straightforward painting event, calling for participants to paint a Dreadnaught (or similarly sized model) during the month of October. 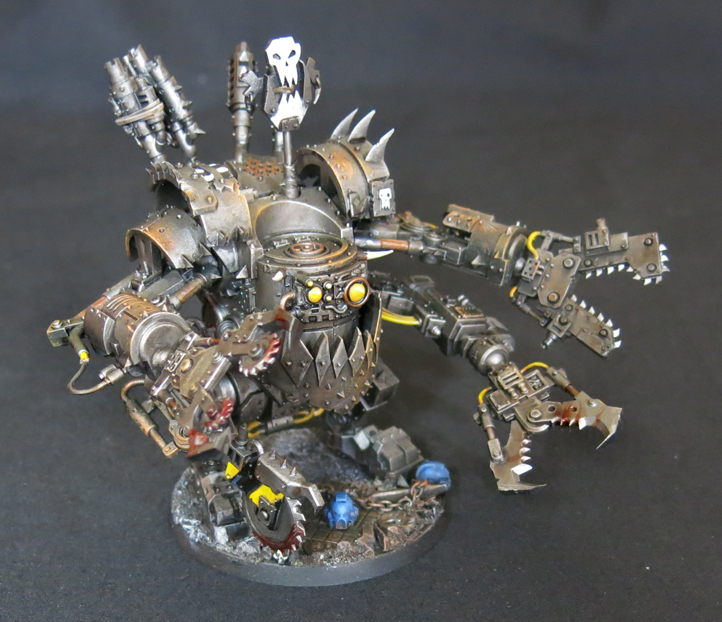 Perhaps simply because it was the first time I’d participated in anything of this nature I found myself captivated by the whole event and painted up a berserk Khornate helbrute (which I returned to and repaired back in May of this year). However running an event like this takes considerable effort. It stands or falls on the sense of community involvement, of many people around the world participating together. The baton passed to Broken Paintbrush in 2016 when again it proved to be a great success but since then things have been pretty quiet and, like many others, I found myself struggling to maintain my enthusiasm. 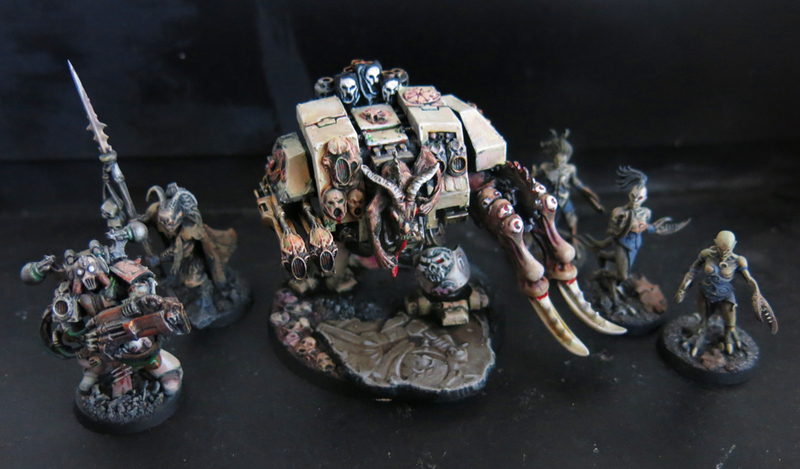 In the end I didn’t even finish the model I’d attempted in 2017 – a Death Guard Bloat Drone – until this May when a different community challenge – Azazel’s first Neglected Model Month – saw it resurrected alongside the aforementioned helbrute. Anyway, I must confess I’d quite forgotten about Dreadtober until I spotted Thomas from HighTimesOnTheEasternFringe was working on one of my all time favourite miniatures – the Tyranid Carnifex – and discovered that Dreadtober has risen again in 2018. I almost finished this Deffdred for Azazel’s Jewel of July challenge but somehow it fell through the cracks, and then just kept falling. Back then it didn’t need much to be finished but somehow the months have passed and it hasn’t seen a single brush stroke. I’d already been wondering about trying to get it finished as part of Orktober (for anyone struggling to keep up with all these challenges that’s the annual celebration of all things greenskinned which has this year been co-opted by GW alongside their Ork releases) but the rediscovery of Dreadtober and the enthusiasm of the early years gave me the shove I needed to actually pick it up, overcome the inertia and get it done at last. 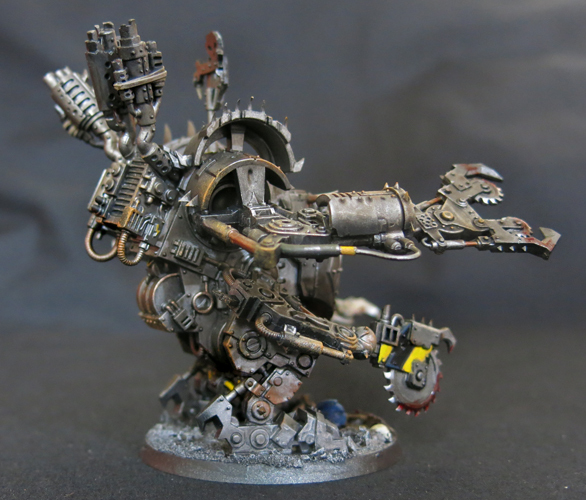 “A Deff Dread’s pilot will take any opportunity to show the destructive power of his new metal body, if only to make himself feel better about the fact that he has to eat all his meals through a straw”. And on that note all that remains to say is “best of luck” to everyone taking part in this year’s Dreadtober and of course a huge thanks to those who’ve stepped forward to keep the event alive in 2018. Time for another Dreadtober update and, with another week under its belt, the bloat-drone is starting to assume its final form. Washes and layering have started to define the model and the ugliest phase of harsh flat panes of colour has passed. Now we get into the really enjoyable part, building up the form of the creature and transforming it from a lump of dead plastic to a living denizen of the 41st Millennium. Will it be done by the end of the month? If I’m honest I doubt it, too many other projects are clamouring for attention and Dreadtober itself is a quieter, less communal affair than we’ve seen in previous years so the impetus to the finish line isn’t what it was. That said Dreadtober has done its work in pushing me through the early stages of getting it painted so from my perspective this has been a success – from here on my preference will be to savour painting this wonderful model rather than rushing to the finish line. It’s been a week since my bold assertion that I would paint a bloat-drone in the month of October and the question on everyone’s lips is; how much have I managed? 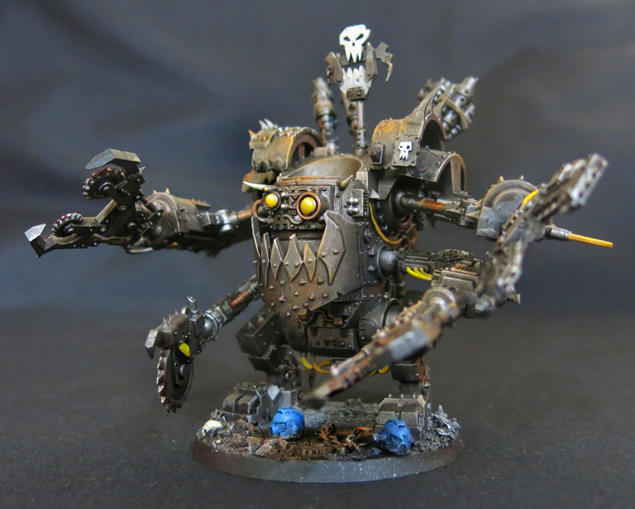 For the uninitiated October has come to mean Dreadtober as hobbyists attempt to get their unloved Dreadnaughts finished before the start of November. 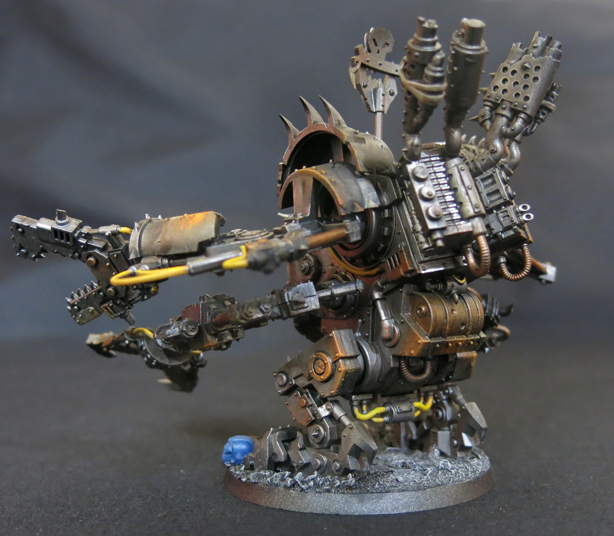 Anything of roughly dreadnaught-sized proportions is welcome, with carnifexs, dreadknights, helbrutes and – in my case at least – bloat-drones all welcome. If you have a dreadnaught shoved to one corner of your painting desk it’s not too late – this could be its moment. I’ll confess that much as I enjoy Dreadtober I actually hate posting WIP images of part-painted models, especially when they’re frozen in the moment when the first basecoats have been applied but the washes are still waiting in the wings and the whole model is a shoddy mess of flat panels and ugly colours. Nonetheless regular progress updates are very much in the Dreadtober spirit so I shall grit my teeth and reveal the current state of the bloat-drone to the world. As you can see it’s not looking its best yet but you can’t pretend I didn’t forewarn you of that! 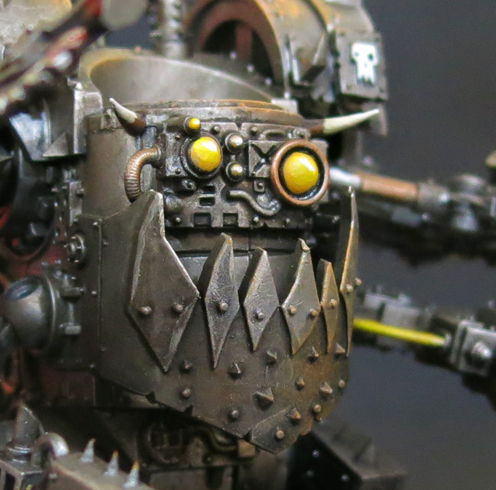 The khornate helbrute, originally painted for the 2015 Dreadtober, is also at a less than prepossessing stage, its flaying arms repaired and – hopefully – upgraded with garish lumps of greenstuff (hence the black and white image). Still lots to be done before the end of the month then but progress is underway at least. Whilst in 2016 it was the turn of this Slaaneshi sonic-ironform. This year however I don’t really have a suitable Dreadnaught or Helbrute to work on. I do however have the foetid bloat-drone from the Dark Imperium boxset which will hopefully fit the bill. To me models like the bloat-drone are perfect fodder for Dreadtober. It was one of the stand out models from the boxset, one of the reasons I bought it in the first place in fact, and yet one that I always suspected I would end up putting off whilst I lived in the moment, flitting like a butterfly from one project to the next. With a deadline to meet however I’m not going to allow it to slip to the corner of the painting desk in favour of whatever else takes my fancy. 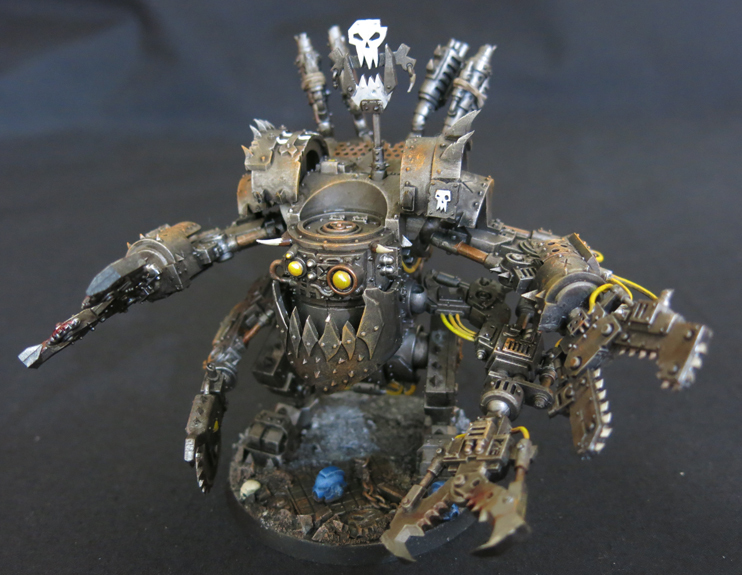 Now I know that this isn’t really a dreadnaught, however Dreadtober is a broad church and equally welcoming to carnifexs, dreadknights and dunecrawlers as it is of dead space marines in stomping up-gunned coffins, so hopefully this buzzing disease infested daemon engine will be equally acceptable. 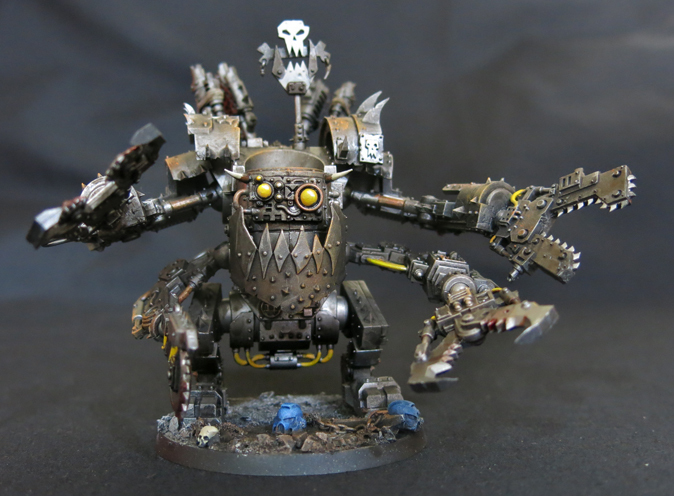 However just in case the lack of stamping legs is just too much heresy for you I’ll also be returning to a project from the first Dreadtober, the flail-waving, Khorne-loving helbrute berserker. The trouble with all those flails is their tendency to snag on things and snap off every time he’s moved and by this point they’ve been reattached more times than I care to admit, leaving him slightly spiky and lopsided. He’s also not as well painted as he deserves to be so a bit of a touch up seems in order – and what better time of year to tackle him than this? 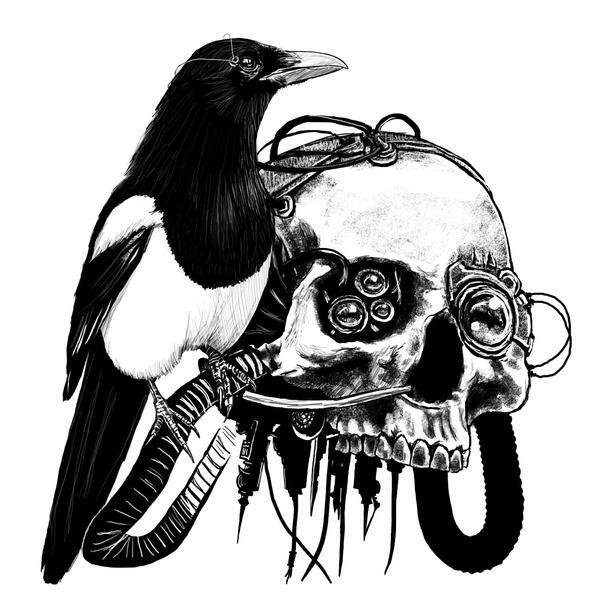 Of course I couldn’t sign off without wishing all the other Dreadtober participants the best of luck in our joint endeavour – and for those of you who’re still on the fence I recommend you go for it. Grab that unpainted and under-loved ‘dread from whatever corner you’ve shoved it into and get to work – by this time next month a shiny new creation will be ready to impress your friends and terrorise your enemies! Two weeks into Dreadtober and the conversion of my Slaaneshi sonic dreadnaught is finally complete (barring odds and ends like the shin armour which will be kept separate for painting and added back in later). The claw-arm is now looking much better with the inclusion of some cables to anchor it to the rest of the model. I’ve also finished off the warp-amp with a few chains to hold it in place (providing some visual consistency with the Nurgle helbrute I built last year). With two weeks to go the first layers of paint will be going on soon but in the meantime your thoughts and feedback are very welcome.